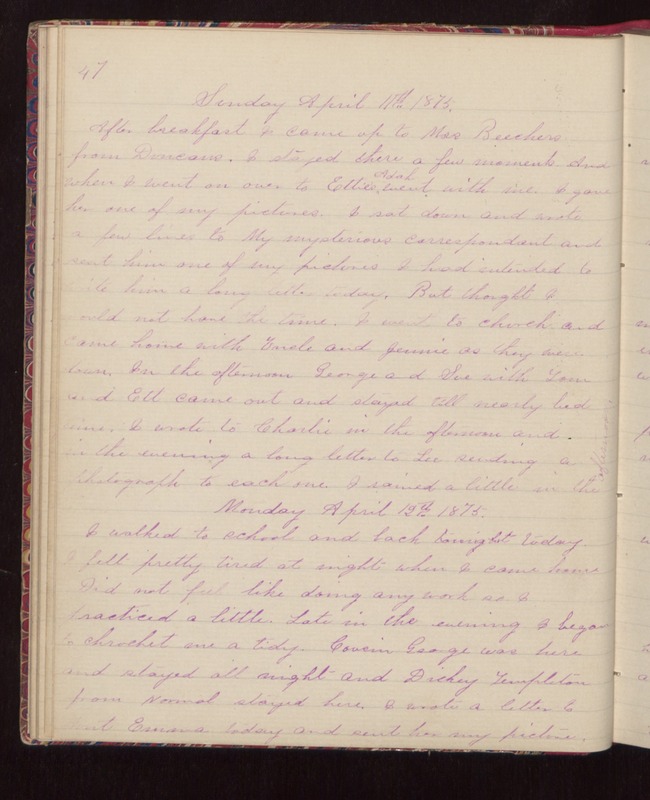 47 Sunday April 11th 1875. After breakfast I came up to Mrs Beechers from Duncans. I stayed there a few moments. And when I went on over to Etties Adah went with me. I gave her one of my pictures. I sat down and wrote a few lines to My mysterious correspondant and sent him one of my pictures. I had intended to write him a long letter today. But thought I would not have the time. I went to church and came home with Uncle and Jennie as they went down. In the afternoon George and Sue with Tom and Ett came out and stayed till nearly bed time. I wrote to Charlie in the afternoon and in the evening a long letter to Lee sending a photograph to each one. I rained a little in the afternoon. Monday April 12th 1875. I walked to school and back tonight today. I felt pretty tired at night when I came home. Did not feel like doing any work so I practiced a little. Late in the evening I began to chrochet me a tidy. Cousin George was here and stayed all night and Dickey Templeton from Normal stayed here. I wrote a letter to Aunt Emma today and sent her my picture.